Odea Donahue has been able to travel through people’s dreams since she was six years old. Her mother taught her the three rules of walking: Never interfere. Never be seen. Never walk the same person’s dream more than once. Dea has never questioned her mother, not about the rules, not about the clocks or the mirrors, not about moving from place to place to be one step ahead of the unseen monsters that Dea’s mother is certain are right behind them. Then a mysterious new boy, Connor, comes to town and Dea finally starts to feel normal. As Connor breaks down the walls that she’s had up for so long, he gets closer to learning her secret. For the first time she wonders if that’s so bad. But when Dea breaks the rules, the boundary between worlds begins to deteriorate. How can she know what’s real and what’s not? 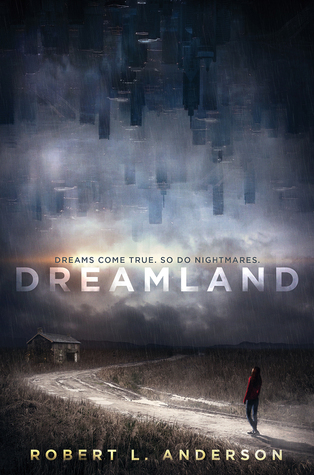 The prologue of Dreamland caught my attention quickly, and I thought I was in for an amazing story. Unfortunately, while the concept is one that fascinates me and the writing is good, the story never quite lived up to the prologue. Odea is a Dreamwalker. She discovered this talent when she was a little girl, and since then she has learned that she has to Walk to stay energized. Dea and her mom are always on the move, running from place to place, town to town. Her mother will never tell her what or why they run, she just tells her when. This last move landed them in a tiny little town with nothing happening, but for the first time since she was a little girl, Dea has a friend. And she might just have met the boy of her dreams. Dea's finally happy, but that doesn't stop the monsters of her moms past from catching up to them... and Dea winding up in serious danger. Dea was a decent character. She was a little underdeveloped in the beginning, but slowly she grew as a character, and as a person. I love her determination on every level, and it's one of the reasons that I hung in there with the story. Her new friend Gollum is the other! She only made a few appearances, but I loved the authors descriptions of her. I wish that she had had more of a presence throughout the story. Maybe in book 2! And Connor was a decent character, too. He was probably the most fleshed out from beginning to end, and his tragic history had a huge impact on his characterization. His history also ends up playing a huge part in Dea's current nightmare. My main issue with this book, and it was a big issue, was the pacing. To me, the pace was almost sluggish. Even when there were things happening, I felt like i was reading an enormous amount of not a lot. The dreams were a cool aspect of the story, but they weren't a huge PART of the story. I had hoped that they would be the biggest part of the plot, but there were a lot of little subplots that took up space. They were mostly good filler for the story, but I wanted more substance. Anyway, I hate writing not so positive reviews. It stinks. So let me throw out some positives. The story is well written, and the author has what it takes to world-build the HECK out of a story. The characters were well-developed, too. The ending left a lot up in the air, so I am guessing book 2 will be coming around sometime within the year. If the pacing speeds up a bit, and more dreams (and Gollum!) are incorporated, I think the sequel has a huge chance of being amazing. I will absolutely be waiting for a chance to read it! Thank you to Edelweiss for allowing me the chance to read an ARC of Dreamland, and share my review!